But when the city’s top investment sales firms experienced one of the biggest team moves to date in October 2016, the industry grappled with a fundamental question: What matters more, the platform or the people? While the answer is still up for debate, some say, the numbers for the past year speak volumes. A little over a year after poaching Eastdil Secured’s star investment sales brokers, Doug Harmon and Adam Spies, Cushman & Wakefield swooped in to capture the No. 1 spot in the city’s hypercompetitive investment sales arena with $6.36 billion across 190 deals, The Real Deal’s analysis of closed sales in 2017 shows. For the first time since 2007, the privately held global commercial brokerage bested the two firms that had long rivaled one another for the ranking’s top spot. Eastdil Secured and CBRE went head to head over the past decade, but gradually the gap between the two widened and Eastdil scored landslide wins. In 2016, the Wells Fargo subsidiary pulled in a record $22.9 billion worth of investment sales, over CBRE’s $6.7 billion. Harmon and Spies’ move from Eastdil to Cushman, however, ensured that 2017 would be a year unlike any other this cycle. And brokers across the industry were not only competing against a potential new powerhouse — they were also suddenly contending with a sharp slowdown in sales. 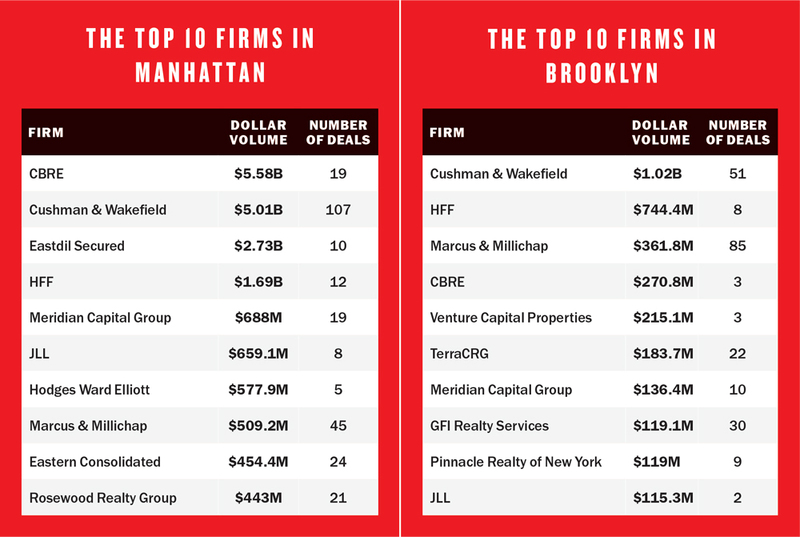 TRD’s ranking of the top 40 investment sales firms in NYC — which factors in closed commercial property sales, ground leases and leasehold interests of $1 million and up — found that those firms closed a combined $28.56 billion, down nearly 48 percent from $54.85 billion in 2016. Cushman, which has in recent years lacked the muscle to knock out dozens of big institutional sales, sought to make a splash in that space while reportedly gearing up for an IPO that has not yet been officially announced. Members of the Harmon-Spies team brokered more than $4.2 billion of Cushman’s total, according to the data. And while the firm is increasingly making a dent with big-ticket deals, Bob Knakal and its middle-market brokers have been prolific with smaller sales above the $1 million mark. Though many firms traded places on this year’s ranking, CBRE’s investment sales team — led by Darcy Stacom and Bill Shanahan — held onto the No. 2 spot, with $6.02 billion across 29 transactions. CBRE also negotiated the largest deal of 2017: HNA Group’s $2.2 billion purchase of 245 Park Avenue, one of the priciest single-building trades in NYC to date. The brokerage held a tight grip on the higher end of the market with more than $5.7 billion brokered by Stacom and Shanahan and the rest handled by a small midmarket team led by Daniel Kaplan, TRD’s analysis revealed. That means CBRE’s core investment sales duo still came out roughly $1.5 billion ahead of the Harmon and Spies team, despite Cushman’s overall victory. Rounding out the top five, Eastdil slid to third place with $2.73 billion, while HFF had $2.54 billion and Rosewood Realty Group came in with $1.25 billion. Representatives for Cushman and Eastdil declined to comment for this story. While Eastdil had consistently brokered most or all of the year’s 10 biggest investment sales in previous rankings, 2017 saw a more even spread among the top four firms. And almost across the board, brokerages saw significant declines in the amount of business they reeled in. There were only a handful, in fact, that saw their volume increase: Cushman, HFF, Besen & Associates and Colliers International, among a few others. Some of the standout deals reported in 2017 have yet to close, and therefore were not counted in the ranking. Those include Rockpoint Group and Brooksville Company’s $905 million purchase of Starrett City; WeWork and Rhone Group’s $850 million purchase of the Lord & Taylor flagship; and Oxford Properties Group’s $700 million purchase of the St. John’s Terminal site. Those closings are bound to supply 2018 with some cushion in the early months. Several brokers said the recent surge in momentum has aided their optimism on the year ahead. This year “will be much stronger — sellers are realizing it’s not 2015, and buyers are realizing it’s not 2010,” said Will Silverman of Hodges Ward Elliott, which took 11th place with $577.9 million. While Cushman’s rivalry against Eastdil and CBRE was a clear headline grabber over the past year, industry insiders have questioned whether the team or the company is superior in the case of Harmon and Spies — and whether it’s fair to pass judgment in an uncertain market. The Harmon and Spies team grabbed a bevy of listings throughout the year, though TRD reported last November that in the 12-month period since Harmon and Spies left, they were still lagging behind their rivals. But even though they delivered on only a few of the listings for most of 2017, their momentum is evident. So far in 2018, the brokers put 7 Hanover Square in contract for $310 million and closed the sales of the Vogue building and the Marquand’s retail condo, totaling nearly $400 million combined. Eastdil, meanwhile, had a calamitous 2017, falling by 88 percent in dollar volume year over year. The firm’s CEO, Roy March, has taken a more hands-on role in the firm’s New York office, which is led by David Lazarus. But aside from brokering Ivanhoe Cambridge’s $652 million purchase of 85 Broad Street and co-brokering New York REIT’s sales of 1440 Broadway and One Worldwide Plaza with CBRE, Eastdil struggled to stand on its own in the absence of its star team. The firm hung on to top-shelf listings such as the News Corp. headquarters, the Park Lane Hotel and a stake in Brookfield Place. And nationally, Real Estate Alert found that Eastdil was still on top in 2017, tackling a total $22.8 billion in office building sales over $25 million — ahead of CBRE’s $19.9 billion. HFF had a strong showing in fourth place in NYC, with a performance buoyed by the $1.04 billion majority-stake sale of 60 Wall Street. The firm’s senior managing director and New York office co-head, Andrew Scandalios, said his team sought to overhaul its strategy to accommodate the slower market. That appears to have paid off as the firm saw a 61 percent increase in volume year over year, a rarity in 2017. “We refocused our business on more equity recaps as sales activity slowed,” Scandalios said. Rosewood, a small 10-broker multifamily-centric shop, held steady in fifth place citywide, but saw its volume fall by 37.4 percent to $1.25 billion due to the overall decline in rental building sales throughout the city. “It was definitely tougher, but I did what I always do,” said Rosewood’s president, Aaron Jungreis. For many brokers, NYC’s investment sales arena is stuck in a transitional period where sluggish business has impeded their progress. The city’s total investment sales volume continued to tumble downward in 2017. Closed sales for the year totaled $34.9 billion — down nearly 40 percent from $57.8 billion in 2016 and 50 percent less than the stellar $71 billion in 2015, according to Cushman data. “This market is furthering the separation between the wheat and the chaff,” said Silverman, referring not only to brokers but also to owners. Some brokerages that have been investment sales staples, including Newmark Knight Frank and Savills Studley, took a major hit in 2017. Newmark came in at 25th place with a meager $137.6 million, and Studley came in 39th with just $47.9 million. Studley was one of the few firms to do serious poaching in 2017, when it hired CBRE’s Paul Leibowitz and David Krantz and Cushman’s Michael Rotchford. Newmark, meanwhile, kicked off its initial public offering to disappointing results and advanced in talks to buy the retail and investment sales brokerage RKF, which took 27th place with $133.3 million. A Newmark spokesperson could not be reached. But while those efforts may sow new seeds for 2018, the past year proved to be in some ways a stumbling block. Other firms have found a silver lining in the overall slump in sales. Meridian Capital Group — which launched its investment sales division in mid-2015 after poaching Eastern Consolidated’s David Schechtman and Lipa Lieberman — took the No. 7 spot this year with $928.3 million. When Meridian debuted on TRD’s ranking in 2016, it was neck and neck with Eastern, with a difference of $20 million between the two firms. But now Meridian has zoomed past its rival by more than $300 million — Eastern took 10th place this year with $615.9 million. JLL took the No. 8 spot in the latest ranking with $774.4 million about a year after five of the firm’s sales brokers left for Colliers. The Chicago-based global brokerage saw a significant boost from its hotels and hospitality group, which operates separately from its capital markets team. Data show six of JLL’s 10 deals were hotels, including the $340 million sale of the Standard High Line. But, all told, JLL slid from fourth place in 2016, when it had $3.2 billion across 13 deals. Meanwhile, the Colliers team, led by Richard Baxter, Yoron Cohen and Scott Latham, carried the firm into 13th place with $382 million. Colliers failed to crack the top 40 in 2016. When it comes to the sheer number of deals, some firms remained leagues ahead. 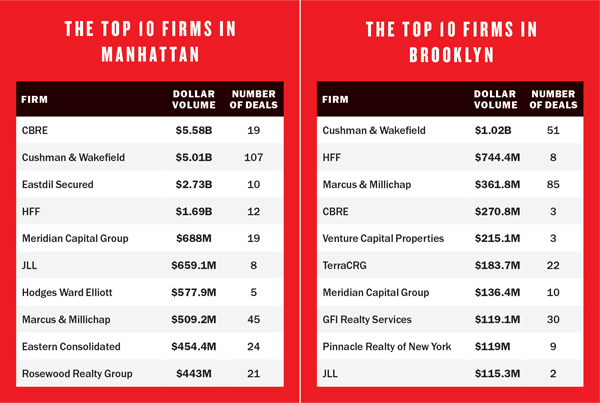 The top two firms by deal volume, Cushman and Marcus & Millichap — with 190 and 162 deals, respectively — have been aided by their outer-borough presence in the past year. Cushman has increasingly cornered the high-volume $10 million-to-$30 million market since acquiring Massey Knakal Realty Services for $100 million in 2015. But one broker source said that a chunk of Cushman’s large operation of midmarket brokers, many of them Massey Knakal alumni, may be tempted to move on in the next two years as the firm grows its big-ticket capital markets business. In fact, James Nelson, a vice chairman at Cushman and former Massey Knakal partner, just decamped for Avison Young last month. As competition heated up and the market slowed last year, it was truly a fight to put buildings under contract and mediate the inherent conflict between buyer and seller expectations. The wide pricing gap led some sellers to pursue alternatives to outright sales. In many cases, investors resorted to refinancing or selling partial stakes to new or existing partners, according to TRD’s analysis and industry insiders. On the trophy end of the market, minority stakes were often the way to go. Closed minority-stake sales such as One Worldwide Plaza, One Liberty Plaza and 1515 Broadway valued those trophy office towers at $1.7 billion, $1.5 billion and $1.95 billion, respectively. Some would-be sellers scrapped plans to sell altogether and instead tacked on fresh mortgages. Walton Street Capital and RXR Realty’s 237 Park Avenue and JEMB Realty’s 75 Broad Street, for example, could have each joined the year’s list of building sales, but instead received $850 million and $250 million refinancings. “If the sales premium was not above the size of a potential refinancing, [investors] said, ‘You know what? I’m gonna hold,’” GFI’s Weiser noted. And investment sales listings languished for far longer than they had in years past due to the widening divide between buyers and sellers on pricing. Numerous brokers said they felt increased pressure to deliver the goods as the year went on. Sources also said that some firms overpriced and overpromised to win assignments in 2017, which also caused listings to linger for longer than usual. “Overpricing is not our game. You can get caught,” Scandalios said, echoing a point that many brokers interviewed for this story made. Not only did Manhattan’s trophy office circuit suffer, but the outer boroughs also entered a period of stagnancy. Multifamily investors scaled back their acquisition sprees, and the days of robust rental building portfolio deals all but vanished. Rosewood has long been a leading brokerage in outer-borough investment sales — and once again reigned supreme in Queens and the Bronx in 2017. 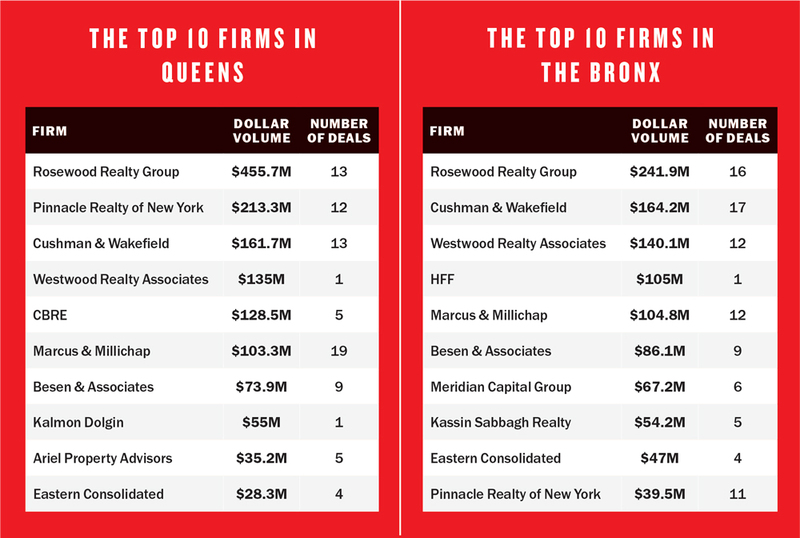 In those boroughs, the firm was far ahead of the competition with $455.7 million and $241.9 million, respectively. But Brooklyn was a different story. While Rosewood took first place in the borough 2015 and fourth place in 2016, it didn’t make the top 10 this time around.Instead, several of the city’s institutional trophy brokerages further invaded the outer boroughs with comparatively bigger deals (albeit fewer trades), thus bumping out smaller firms that specialize in those markets. NYC’s cooling multifamily climate has also changed how brokers go about closing deals. Sellers of large multifamily portfolios have increasingly traded their assets in smaller chunks — and sometimes with multiple brokerages on tap. Investment sales brokers also continued to find new opportunities in neighborhoods they had previously not been as active in. While Chinese investors were a major force in the investment sales market in recent years, China’s rollout of capital controls in late 2016 made many of those firms less prominent buyers in 2017. “Chinese investment may stop altogether, but there is no shortage of capital in the market,” said Stephen Shapiro, one of Colliers’ senior managing directors who joined from JLL last year. He noted that Japan and Singapore are still active in NYC. And several domestic buyers came to the rescue on deals that might have otherwise attracted Chinese investment. In January, Connecticut-based insurer W.R. Berkley Corporation made its first big New York purchase, buying 600 Lexington Avenue for $305 million, and Boston-based AEW Capital Management entered contract to buy a 470,000-square-foot office building at 330 Hudson Street for $385 million. New York REIT and Joseph Sitt’s Thor Equities have been two of the firms most eager to sell their holdings over the past year. Thor switched up brokerages for several of its listings — from 530 Broadway to several Fifth Avenue properties — in an effort to unload assets burdened by the retail crisis. New York REIT, which has been liquidating its multibillion-dollar office and retail portfolio, has had better luck. The Wendy Silverstein-led real estate investment trust aggressively sold one building after the other last year, including 1440 Broadway for $520 million and a stake in One Worldwide Plaza for about $840 million. Those deals, in particular, boosted sales volume for Cushman, Eastdil and CBRE. Despite the uncertainty surrounding the fate of the investment sales market, brokers are still confident in the appeal of NYC and its many trophy assets. Those constants, many argue, will quickly and easily outweigh the recent slowdown.